So, with the ending of the first book things were nicely set for the sequel. Middle books in a trilogy can often be a problem and get overshadowed by the first and third parts. That is somewhat the case here; although, all is not lost. This book starts a lot slower than its predecessor. It still held my interest, but I was relieved when the action lifted a little in the second half of the story. In the latter chapters, Collins did a good job of building the tension ready for the coming finale. 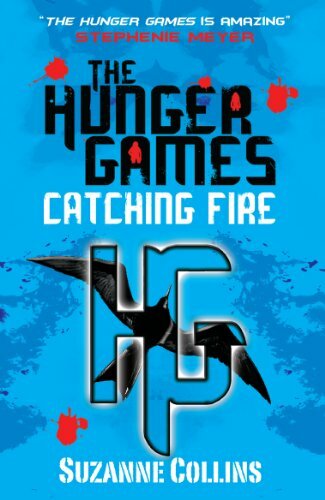 This book lacks the impact of The Hunger Games, but it does its job maintaining the characters and the storyline and introducing some new faces and themes along the way. It's not as enjoyable as a standalone read, but it does well in its role as a conduit, leading us towards the final battle of Mockingjay. I am two thirds through Mockingjay already, so expect a review of that in the next couple of days. I look forward to seeing how Collins will end what has been a well-written, intelligent and thought-provoking teen series.